Win a Warriors in Pink/Biggest Loser 2014 Ford Fusion Energi Plug-In Hybrid! Are you a Biggest Loser fan? If so, you most likely saw Rachel win the 2014 Ford Fusion Energi Plug-In Hybrid when she came in first in the first-ever Biggest Loser Marathon. Now you have a chance to win that same model! 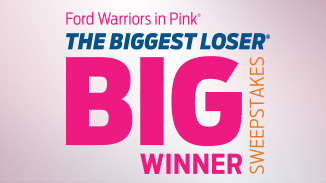 Ford’s Warriors in Pink® and The Biggest Loser have teamed up to offer The Biggest Loser BIG WINNER Sweepstakes! Just follow the link below and enter. SO much easier than tackling a road race! NO PURCHASE NECESSARY. Sponsored by Ford. Sweepstakes ends 02/28/14. See Official Rules for details. © 2014 Ford Motor Company.